What is the Eraserhead baby? 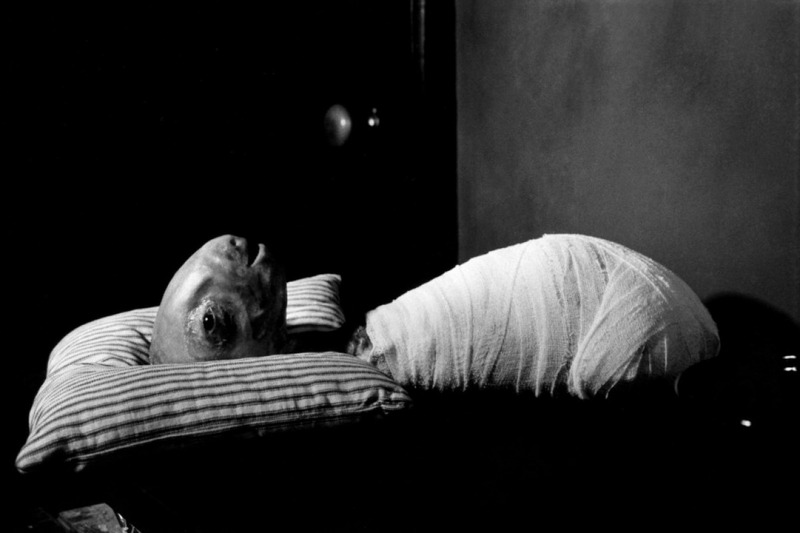 As anyone who has seen the movie will tell you, the Eraserhead baby is the stuff of nightmares. The baby itself is famous for being somewhat of a mystery. David lynch refuses to discus the baby, what it is, how it was created, or why it's so gosh darn creepy. The few comments he has made have been cryptic. Statements such as "it was born nearby" or "maybe it was found" have lead to rampant speculation including theories that it could possibly be such things as a skinned rabbit or a cow, lamb, or even human fetus. The prop itself, nicknamed "Spike", featured several working parts making its eyes, mouth, and ears capable of independent operation. What is the baby actually made of and what evidence do we have to prove this? The answer to that question is; no one will ever know. David Lynch knew he was onto something ethereal, so he prohibited any promotional photos of the baby and forced his SE crew to sign a release saying they could never talk about it. Lynch, himself, has always been elusive at best. All anyone will ever have is speculation, until Lynch decides to spill the beans. I want to add that the idea that the baby was living tissue has 2 main roadblocks; decomposition and Rigor Mortis. It is highly unlikely the baby was actually living tissue, though it may have been modeled on such. I have seen mention that it somewhat resembles a sheep fetus, so that may have been the vision Lynch worked from. Lynch would have needed several such fetuses for multiple days of filming, which just doesn't seem plausable. So there's one possible explanation - the baby is representative, in some way, of his own daughter (it's also worth noting Lynch's marriage broke down 18 months into the shoot of the film). The mutant baby was apparently created from the embalmed fetus of a calf, although David Lynch has never confirmed this or described how he articulated it. During filming when he watched rushes, he even had the projectionist cover his eyes when takes with the baby were playing, so that no one would know how it was made. After completing the film, Lynch reportedly buried the "Embalmed Calf" in an undisclosed location. At the wrap party, they had a mock wake for it. However, it cites no sources for this information and so it's impossible to determine how likely at all it is. The meaning of the baby and the movie remain elusive - saying Eraserhead is about the fear of fatherhood is a start, but it doesn't begin to explain everything. Lynch is famously reluctant to discuss the meaning of his work; with Eraserhead, he has always refused to explain how he created the baby as well, which has helped it retain much of its power. The thing looks like a crude puppet, but it has a sticky organic quality as well that has led people over the years to speculate that it's made from a cow fetus or other once-living tissue. I Googled "cow fetus" and don't think that's what it is (also, blechhh), but that the idea is even worth fact-checking says all you need to know. No one really knows because David Lynch won't confirm or deny anything. I think it's just a well made puppet. I believe the black and white helped it to look realistic. Latex covered in slime would be harder to pinpoint in black and white than it would be in color. It's clearly based on an animal foetus but it's a prop. Maybe some real foetuses were used in some of the shots with the eyes because they just don't look like they could be done by SFX. But I don't think the whole thing is a foetus. As has been said, it would rot. It's just a very well modeled piece of latex with a lubricant on it. He knows what he is doing by not discussing it. Not the answer you're looking for? Browse other questions tagged props david-lynch eraserhead . What purple items have Samuel Jackson's characters had? What is the symbolism of the remote controlled toy car? What is this poster in the background? Is that a real baby? What is the prop meth made of? Why did Cameron show the baby doll so prominently in Titanic? What are the towers on Tatooine? What is the meaning of the smoking hair in Yellowbeard?